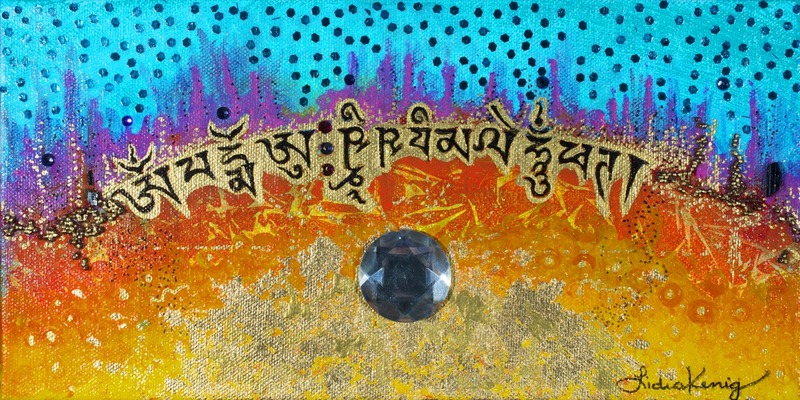 A customized sacred art created while chanting the powerful Wish Fulfilling Mantra brings a sense of well-being and peace to a home or office. Click on Blog and read many testimonials on their effectiveness. Original is sold; wrapped and embellished canvas prints and paper prints are available for purchase. Prints tend to be useful for immediate healing needs or life situations that resolve themselves in the best way possible in the short term. Originals work on deeper issues, long term situations and past karma. ***Please note that only canvas prints are blessed and embellished. Contact the artist for additional information.